Now that my teeth have stopped chattering, I can compile my thoughts on a race that challenged both a competitors’ mental and physical toughness. If only the Mooseman Int’l Triathlon (.93 mi. swim, 27 mi. bike, 6.2 mi. run) had been Friday, June 1st on what was a picture perfect day up on Newfound Lake! 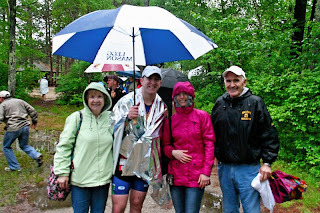 Unfortunately, the race was Saturday, which proved to be one of the coldest, wettest days I’ve seen up there. The morning started out promising as I drove to the race with no rain and dry roads. Thirty seconds after arrival the skies opened up, and didn’t slow down until the end of the run. I got into transition, racked my bike, and set up my gear. I thought I was ahead of the game by bringing my plastic bike coat to lay over my gear and keep them from getting wet. This was about the only proactive thing I did when it came to keeping things dry, as I did not think about having a dry set of clothes post-race! This was a valuable lesson learned from the day. I put my wetsuit on early and spent some time in the warming tent to try and stay warm before heading to the Swim Start. 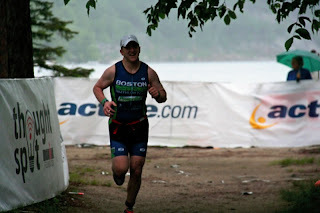 It was a huge relief when they called my wave to the swim start since it was warmer in the water than on the beach! Finally, its GO TIME! I had a strong swim, rather uneventful. My positioning was pretty solid, so had a clear lane throughout the swim exiting the water warmed back up and with a time of 29:05 (2 minutes faster than last year!). Before I knew it I was through T1, and onto the bike, which would prove to be very WET! Luckily, I have ridden the bike course multiple times, and knew where the steepest descents were that would be the scariest on this day. I took caution on these hills and hoped to make up time in the flat sections of the course as well as on descents that were more gradual. This proved to work well as I knocked 2 minutes off my bike split from 2011! Apparently that was 2 minutes too many as Ali and my parents never made it in time to see me finish the bike… I actually thought they had enough of the rain and left! My only regret on the bike was leaving my arm warmers in T1, as the rain can really hurt when it pelts down on your skin at 10 mph!! After struggling to get my dry running shoes over my soaking wet feet, I was off onto the run. The run course is great as it goes along the lake and the West Side Ledges. You have great views out over the lake and mountains that help the time go by quickly! 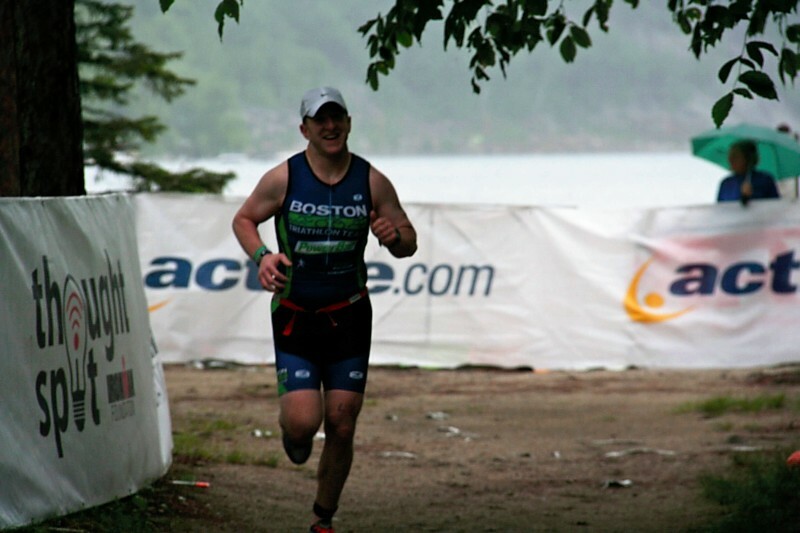 I felt great getting off the bike, and probably the best I have in my short triathlon career. Having an out and back was nice, as I was able to see fellow BTTers Matt Mead, and Mary Beth Begley on the way back tearing up the course! Matt and I had a complete fail on a knuckle bump as we passed each other, which was obviously a result of us each traveling at Mach 1 speed! In the last mile I was able to reel in and pass another guy in my age group, which moved me up to 5th! I kicked it into gear, and finished in 49:01, 3.5 minutes faster than last year! I grabbed my finisher’s medal, a mylar blanket and found my family, who apparently did NOT leave like I originally thought! I watched Matt come across the line in a great time, and chatted with him for a few minutes. Unfortunately, the conditions were proving too much, and I was quickly cooling back down. I decided to go pack up and get going as quickly as possible, so I missed Mary Beth finish. I could not wait to get back to the car and crank the heat… But first I checked out the Ironman store, which worked out nicely since they had a nice DRY t-shirt on sale for $4.99… which I quickly purchased and put on to have 1 article of dry clothing! Despite the chills pre and post-race, I had a blast on Saturday. The rain and cold just added other variables to the race that EVERYONE had to deal with, not just me. I went in with the goal of taking 5 minutes off my 2011 time, and ended up with an approximate 9 min. course PR! With the roll down from the Overall, I snuck into 4th place AG. I have been checking my mailbox every day in hopes the bottles of syrup went to the top 5 in each AG! One can only hope!! !